This 2-string Hematite and Gold Mother Bracelet is shown with 4 names: Logan, Megan, Allison and Katie. They picked one of my beautiful, free and simple sterling silver lobster clasps. This Gold, Hematite and Sterling Mothers Bracelet is designed with 6mm smooth round Hematite beads, 14k gold-filled and .925 sterling silver beads and a sterling silver toggle clasp (you choose the clasp during checkout). The price is per string. Also available in all sterling silver and Hematite. This is 1-string Hematite and Gold Mother Bracelet with 2 kids' names: Oliver and Lucas. They added a Angel with Wings charm and upgraded to my Heavy Heart Toggle clasp. This 2-string Hematite and Gold Mother Bracelet is shown with 4 names: Logan, Megan, Allison and Katie. They picked one of my beautiful, free and simple sterling silver lobster clasps. 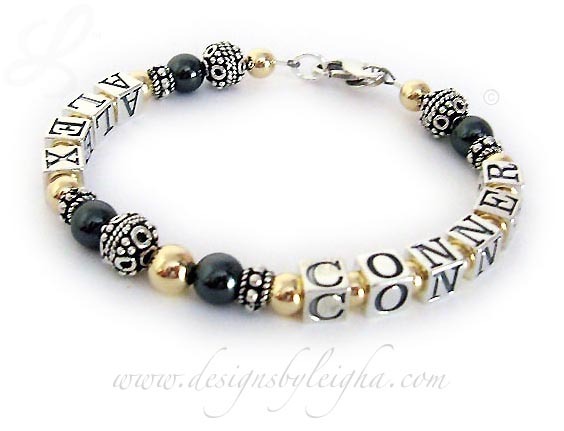 This 1-string Hematite and Gold Mother Bracelet is shone with 2 names: Alex and Conner. They picked one of my beautiful, free and simple sterling silver lobster clasps.